After five dramatic rounds filled with countless counter-punches, an inadvertent eye poke, a misplaced mouthguard, referee confusion and of course relentless heart, Michael Bisping walked away with the biggest win of his career as the UFC took over London once again. In front of his home nation, The Count outworked who many have regarded as the greatest mixed martial artist of all time as he edged Anderson Silva in a five-round war at the O2 Arena - at the top of a card where the Brits rose to the occasion. But it was hardly bizarre. While a third-round celebration from the Brazilian - despite the fight not being over - would have baffled many spectators, the out-pour of emotion from Bisping after his defining victory and the respect shown between the two competitors showed exactly what the sport is about. It was compelling right from the bell, following a touch of gloves. Bisping controlled the centre of the Octagon early looking to pressurize his opponent; while Silva seemed patient and awaited his opportunity. While there weren't a barrage of strikes landed in the opening few minutes, plenty was going on; before the former champion upped the ante, aggressively charging down with a few moments remaining in the frame. However, Bisping's confidence would be sky high at the conclusion, when he rocked Anderson with a left hook - the competitive nature typified as both were separated by the referee after an intense staredown at the sounding of the klaxon. Things seemed to be going in favour of The Count in the second round also, despite the South American demonstrating his confidence with trademark showboating, awaiting the strikes and looking to dodge as he was on the outside. He did land a few of his own but it was the Brit controlling the fight, putting yet another exclamation mark on it as the round ended, landing flush to drop him, finishing on top and met with a rapturous applause. Criticised in past occasions for being a slow-starter, Anderson Silva began to look in his element in the third round. Throwing with much more volume and creativity, signs of the Middleweight who once ruled the division for many-a-year were potent; and his killer instinct was at its best during a moment of confusion late in the round. Bisping's mouthguard fell out midway through an exchange, throwing the fighter off guard as he awaited the opportunity to get it back. But, instead of looking at the obstacle in front of him, Bisping was pointing to the referee to give him it back - but before Herb Dean could find the right opportunity, Silva dropped his opponent with a thunderous flying knee, right as the round ended. Pandemonium ensued as Silva celebrated thinking he had won the fight, but it still continued - although the blue-cornered fighter was now in dire straits after being cut open by the late strike. Just as it seemed that the writing was on the wall, we learnt not to count The Count out. Embodying true warrior spirit, Bisping soldiered on, blocking many strikes and still coming back with some of his own. He was being backed up much more frequently, though, and a Superman Punch to end the round made things rather even - depending on how you scored it, of course. With the capital of England in full voice to appreciate the war, the main-eventers were ready to write the last chapter of it. 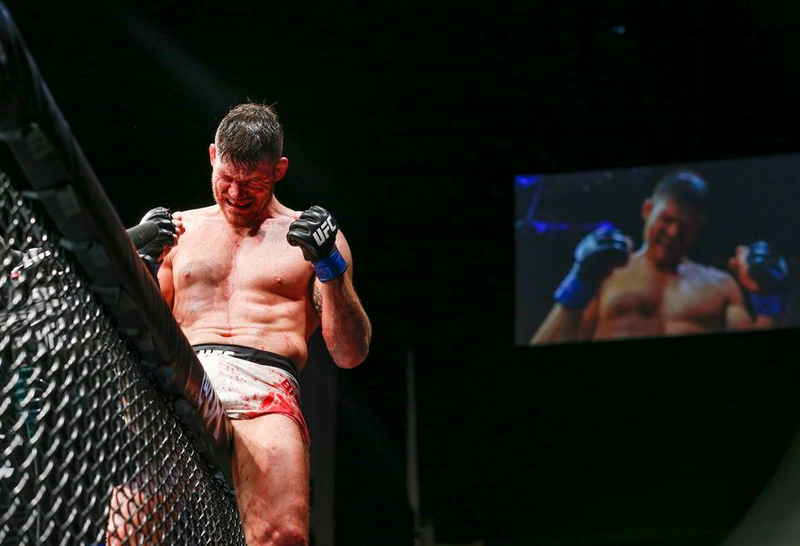 One thing was for sure, a doctor would not give Bisping his first loss in England - Herb Dean called him in to check on the cut, but vowing to fight on, the veteran lasted it out. A thunderous front-kick to the face really stunned him, as Silva stepped it up to try and secure a finish; mixing up his strikes and fending off a takedown attempt, before both went toe-to-toe as fans got off their seats in awe. It had went the distance and now the fate was in the judges scorecards. All three judges agreed that Bisping won three out of the five rounds, hence a unanimous decision victory which was met with emotion as a career milestone was achieved for the Briton. "I'm one of you guys, I'm a guy from a normal background and you guys give me the opportunity. I don't know what to say, I'm crying," he told Dan Hardy after the fight. Speaking about his opponent, Bisping was appreciative: "I worship this guy. He’s the greatest martial artist of all time. I know I said things. The respect I have for you, you inspired me." Meanwhile Silva thanked the people of London, adding that he "thought it went differently" and "thought it was completed".